After five weeks break Men’s European Champions League is coming back this Friday and Saturday by Round 4 games, and it could be last chance for some clubs to get quarter final spot. One of them is ten times European champion Borussia Dusseldorf who expects the 2008 winner Niederosterreich in MECL Classic. In Group A, reigning champion Fakel Gazproma Orenburg goes to France to meet Vaillante Angers. Russians won first game at home 3:1 thanks to new individual European champion Dimitrij OVTCHAROV who took two points (BROSSIER and LUNDQVIST). Orenburg has 2-0 score, Angers 1-1, and French side will stay in very good position even it lost, because of big win against Ochsenhausen (3:0, 9:2 in sets) which still has no victory. Guests are arriving with their best line-up: Vladimir SAMSONOV, Dimitrij OVTCHAROV, Alexey SMIRNOV. “Vaillante Angers is a very strong rival. We managed to beat them in a hard fight in Orenburg. So our preparation for the match is very serious. We’ll use our best forces. Our players are concentrated on the victory, especially taking into account that our success in France will make us the winner in our group”, Orenburg`s coach Valeriy SALABAEV said. Group B offers battle for the top spot at Verkhnaya Pyshma where Russian champion UMMC (3-0 score) plays for fourth victory in a row against Pontoise (2-1). Their first meeting was very close, having five games and amazing ending in which JUN Mizutani and TAN Ruiwu turned the match. First Japanese leveled against Marcos FREITAS (3:2), while TAN brought winning point in clash with Tristan FLORE (3:2). No matter how this game will be finished, the ultimate round between Pontoise and Saarbrucken at Germany should be decisive one for quarter final places. French side won 3:2 (10:9) in first game. This weekend Saarbrucken (1-2 score) goes to Sweden to meet Eslov who still has no win. Group C is most interesting one having all three clubs with 1-1 score: Werder Bremen, Hennebont and Walter Wels. This Friday German champion plays at Austria for revenge, after surprising lost in opening round at home (3:1). 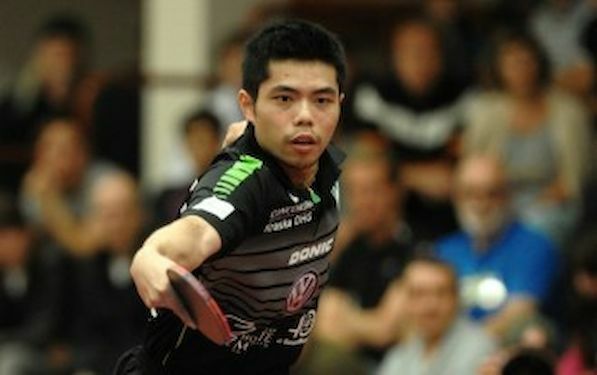 ZHAN Jian was a big mystery for Constantin CIOTI and CHUANG Chih Yuan and third point for Walter Wels provided Serbian Zolt PETE against Adrian CRISAN. Zhan has 4-0 score in two rounds, but his two wins were not enough to stop Hennebont`s victory (3:2) in Round 3. Finally, two great MECL clubs will have their new battle. Borussia (0-2) and Niederosterreich (1-1) used to play one against another in last couple of seasons and Germans had more successes, but last December Austrian side went to the quarter final from group stage. It’s clear that Chartres (2-0) will go to the next stage this time, so just one of two rivals this Friday at Dusseldorf can progress among the best eight teams. Niederosterreich won first game at home (3:2) but Borussia now can count on Timo BOLL, having much better team’s shape. Austrians are hoping that LEUNG Chu Yan could have again his day and maybe, as he did at Schwechat, bring new two points.